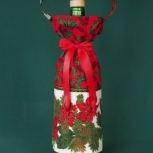 This Festive Bottle Sleeve has a white with holly and berries body. 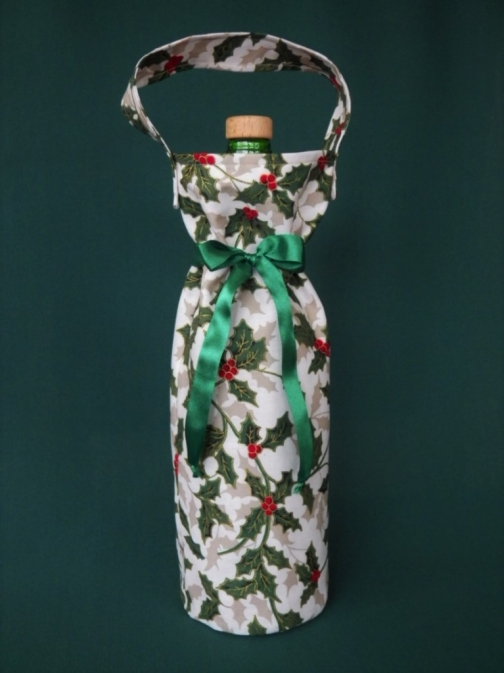 Sleeves are fully lined, feature a round, form fitting bottom and are hand washable in cool water. Install a gourmet bottle of olive oil, a flavoured vinegar or a special jar of pickles for your foodie family member or friend. 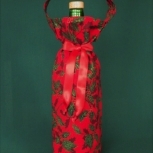 Simply insert a quality bottle of wine and you have a standout gift for the hosts of your next dinner party. 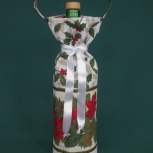 Encourage re-gifting the wine sleeve with the latest trends in wine among your circle of friends for many parties to come. As a thoughtful gift for the person on your list who likes to take a long hot soak, just pop in a luxury bottle of bath salts, bubble bath or scented bath oil. The height stated does not include the handle. 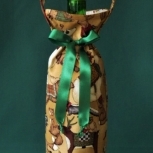 Bottle not included.